Vacation travel can provide a welcome break from the day-to-day demands of our busy lives. With limited time, it's tempting to use online services to help us plan that perfect getaway. But the easiest options are not always worth that convenience. The last decade has brought tremendous change to the Hospitality marketplace. Not all of that change has been for the benefit of travelers! Whether it is for a hotel room, a vacation home, or even a treehouse, when you reserve a place to stay through their listing websites, Online Travel Agency (OTA) giants like Expedia, Priceline, AirBnB, HomeAway/VRBO, and TripAdvisor/Flipkey now add mysterious "booking fees" to the cost of your vacation. These fees often add hundreds of dollars (typically 10 to 20%) to the total cost of your reservation. These are not flat fees! They are not even fixed percentages. Travel sites will not disclose how they are calculated, because the rates change depending on instantaneous market conditions. These corporate giants are not simply covering their costs, seeking a modest, honest profit. These booking fees are designed to extract as much profit from vacationers as the Hospitality market will bear. The actual fee amount is often hard to find or even hidden until the very end of the transaction. That in itself should be a red flag. Why not be up front about it? The OTAs would like you to believe that they deserve these fees because of the services they provide. They want you to believe that by booking through their website they will provide you with the Best Match to your needs, and will always protect your security as well as your privacy. And they would have a point, were that actually true. Don't be fooled! Be sure to read the fine print. And take a few minutes to search consumer advocate websites for real traveler experiences with the OTAs and the "services" they provide. You will see that your skepticism is warranted. "Privacy" policies that treat your personal data as one more opportunity for profit. When we shop for the best travel lodging, we need to see what is available that will best fit our needs, not the OTA's needs. When we find what looks like a good match, we need to be able to communicate freely with the owner or manager, so that we can be sure our choice was the right one. When we decide to book, we need to be sure that our payments will be applied correctly and that our legal rights will be protected. They often show us accommodations that do not at all match our stated needs or preferences. Why is that? They force all communication to go exclusively through their platform, and then censor any content they do not approve of. Why is that? They force all financial transactions to go exclusively through their own payment systems. Rarely do they refund their fees. Why is that? Ask yourself: are these "services" really worth hundreds of dollars of additional cost to you? you can assure yourself that the transaction will be secure and that your legal rights, and your privacy, will be protected. 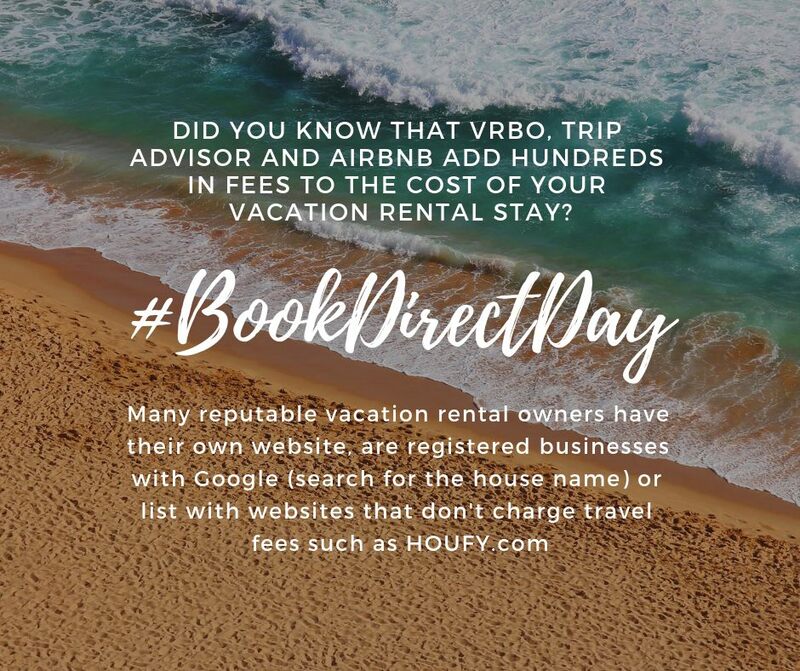 Here is the key: when you take the time to #BookDirect, you retain control. Yes it will take more of your time to #BookDirect. But that will be time well spent. First, you can still use the giant OTA websites to see what might be available in your destination. You might even make initial contact with the owner or manager through the OTA website. Just don't complete the transaction there, or overtly suggest that you prefer to #BookDirect. Be aware that OTAs may try to punish or remove users who do not complete bookings through their platforms. After all, collecting their fee is Priority One. When you find something you like, look for #BookDirect clues in the listing, such as a brand name or unique key words. Enter these unique terms into a generic search engine such as Google or Bing. This will usually lead you to their listings elsewhere, to their own website, or the property’s Facebook page. The goal is to find one or more web pages that provide direct contact information, such as an email address or phone number. And if the property does have a wide presence in generic search engines, it's a good sign that the owners operate it as a real business, one that cares about its online reputation. Also be aware of "aggregator" listing sites that provide listings, often without the explicit permission of property owners. Some of these will refer the visitor to the owner's website for more information; no problem there. However many of these aggregator sites are owned by, or partners with the OTAs. They wil refer visitors to the OTA's website and encourage you to book as soon as possible. You can even search using the listing's lead photo itself, but be aware of scammers! A common scam is to steal photos from legitimate websites and then create a free listing on Craigslist, fraudulently posing as though they are the true owner. A legitimate listing will nearly always have a web presence elsewhere too; use those other sites to cross-check facts, to find contact information, and to confirm that all listings lead you to the same person. You can also try StaySavr.com, which has collected direct contact info for 70% of listings that were present on VRBO in 2016 or earlier. Once you have found direct contact information, you can reach out to the owner or manager, knowing that your discussion will not be inspected or censored by the OTA. If the discussion leads you to be comfortable with the property and the owner, then follow their instructions to complete the transaction through them. Take the time to do your homework. Check online reviews. This goes for OTAs as well as hotels and vacation rentals. Realize that reviews can be fake, yet it is hard to fake a large number of reviews. Also you can often tell whether or not a review is honest just by reading it. If you are suspicious, try to confirm property ownership. Many counties have tax records available online. Or just ask the question! If you are not given a rental agreement, ask for one. Be sure to read it in full! A signed rental agreement protects both parties, and is a sign of a responsible business operation. Use payment services that allow you to contest charges, such as credit cards and PayPal. You cannot contest a payment by check, or cash, or money order. Communicate! Promptly communicate any questions or concerns you may have before, during and after your visit. You have no answer unless you ask! If you are concerned, have a phone conversation! It really helps understand the person you are doing business with. Legitimate business owners are happy to do that – especially since it helps them understand the kind of person you are too. To get you started, here are a few links to quality lodging you can book directly. But this is just a sample of what is available to you, only a few searches away. You may be surprised at how easy they are to find!